Our Nano Soft Salt Free Water Softener and Conditioner provides a chemical free safe alternative to traditional salt based water softeners. Recent developments in nano-technology have provided the first breakthrough in 50 years in the water softening industry, a technology called Template Assisted Crystallization (TAC) has produced the first effective Whole House chemical free scale prevention system. If you prefer complete protection from scale throughout the house or business while at the same time eliminating the use of salt in your water softening system, our Nano Soft Salt Free Water Softener is the perfect softener for you. Unlike traditional salt based softeners, our Nano Soft Salt-Free Softener has no slimy soft water feel. Our innovative system provides complete protection from scale throughout the house or business with little to no cost to maintain. Complete protection from scale throughout the house or business. Cleaner, whiter clothes; less soap usage for residential applications; no scale or other deposits on commercial applications. Long lasting media removes existing scale from pipes, water heaters while still preserving beneficial mineral content of your well water. Incredible money back warranty and professional US based customer service. 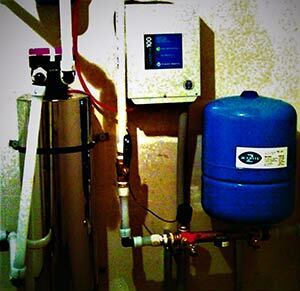 Let Pure Water Solutions provide you with one of our trouble free Salt Free water softening systems giving your family safe purified well water for years to come.